CAL-Xtra is especially formulated for horses consuming tropical pastures or hays where calcium uptake is reduced by oxalate compounds in the pasture and hay. Oxalate compounds bind calcium, reducing its availability, which can lead to an artificially induced calcium deficiency. Contains a concentrated source of bone minerals – calcium, phosphorus and magnesium in an optimum ratio to correct low or inadequate levels in the diet. Acidified formulation to facilitate calcium uptake from the small intestine. Contains vitamins A & D which have roles in the regulation of calcium absorption and utilisation, required for the growth and maintenance of bone. Adhering low dust formulation for minimum wastage in feed. 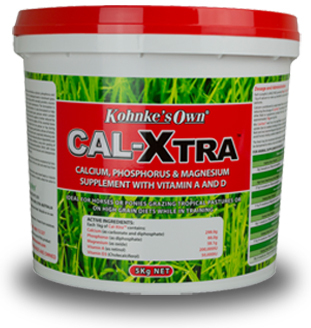 CAL-Xtra is an ideal bone mineral supplement for horses grazing long term on oxalate pastures. High oxalate in tropical grass pastures may reduce calcium uptake and result in Nutritional Secondary Hyperparathyroidism (NSH), commonly known as ‘Big Head’.